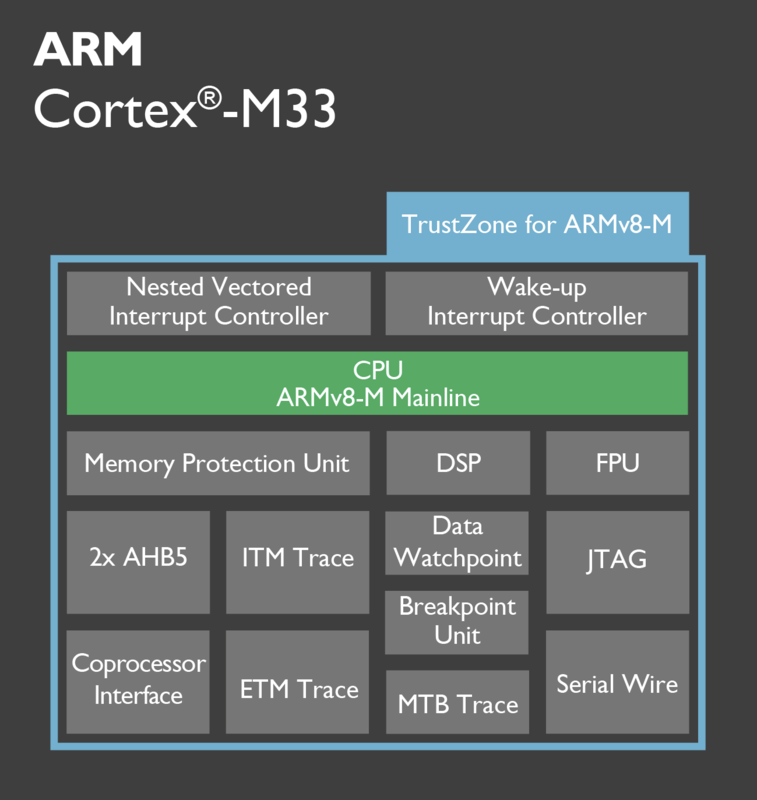 ARM TechCon 2016 is now taking place in Santa Clara, California, USA, as ARM has made three announcements for the Internet of Things, the focus of SoftBank going forward, with two ARM Cortex-M ARMv8-M cores integrating ARM TrustZone technology, namely Cortex-M23 low power small footprint core, and Cortex-M33 core with processing power similar to Cortex-M3/M4 cores, as well as Cordio Radio IP for Bluetooth 5 and 802.15.4 connectivity. ARM Cortex-M23, based on the ARMv8-M baseline architecture, is the smallest and most energy efficient ARM processor with TrustZone security technology,and targets embedded applications requiring both a small footprint, low power, and security. Its power consumption is low enough to be used in batteryless, energy harvesting IoT nodes, and is roughly a third of Cortex-M33 processor size, and offers more than twice its energy efficiency. Cortex-M23 is a two-stage pipelined processor, software compatible with other processors in the Cortex-M family. You’ll find more information on ARM Cortex-M23 product page, and related blog post. ARM Cortex-M33, also based on ARMv8-M architecture with Trustzone technology, is the most configurable of all Cortex-M processors, includes FPU, DSP, a co-processor interface, a Memory protection unit (MPU) for task isolation, and ARM claims it “delivers an optimal balance between performance, power, security and productivity”. The Cortex-M33 processor has an in-order 3-stage pipeline, which reduces system power consumption, and most instructions complete in two stages, while more complex instructions require three. The core also has two AMBA5 AHB5 interfaces: C-AHB and S-AHB, which are symmetric in nature and offer identical performance of instruction and data fetches. You can visit the products page, and ARM blog post for further details. 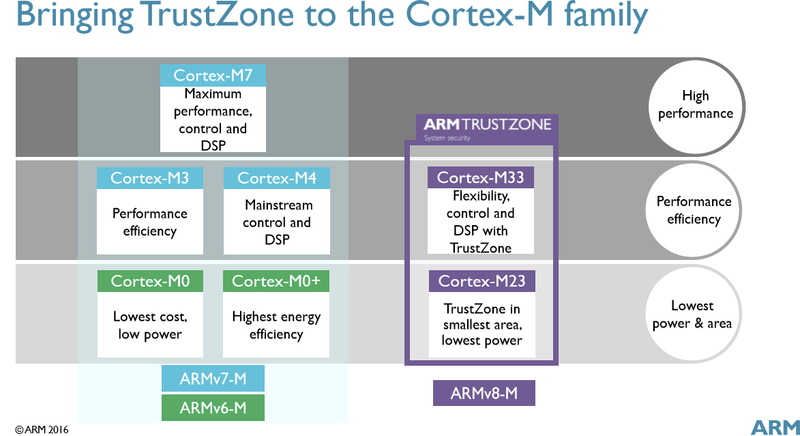 ARM has also introduced Cordio IP which offers Bluetooth 5 or 802.15.4’s ZigBee or Thread connectivity using ARM RF or 3rd party front-end. The IP supports TSMC 40nm LP/ULP, TSMC 55nm LP/ULP and UMC 55nm ULP manufacturing processes, and three solutions are available with Cordio-B50 with Bluetooth 5 only, Cordio-E154 with 802.15.4 only, and Cordio-C50 with both Bt5 and 802.15.4. More details can be found on that ARM community blog post. Isn’t securing IOT more a software issue? It’s to prevent non approved software from running on devices with these MCU’s, especially with regards to firmwares and things that can change secure features of the device based on these MCU’s. @TLS but only when used effectively and not to lock down the device, as a number of manufacturers do, like Amlogic.